Here are some eQSLs' from the last batch. The QSO's are all made with QRPpp and while using the Lowest Possible Power. QRPpp is the (not official) term, that I use for a power of less than 100 milliwatts. Also known as two digit milliwatting. Making QSO's with very low power is not that difficult. It´s all a matter of propagation. The changes in propagation can be hugh. So when the S-meter goes 20 dB up, the power can be reduced by 20 dB. Look for a station that is calling CQ,with an earsplitting S++ signal. Answer with low power, with the excellent timing, that you always use. Don´t suspect anything, but be prepared, after you give your call. Most of the time, other stations are answered. But than suddenly, when the frequency is clear, then you will be heard. It´s possible that you are surprised, that you hear your call, being send immediately correct. And before you know it, you also get an exchange. What was that? What number did he gave? hi. See me smile, from ear to ear, after such a QSO. I never use a fixed power, but adjust my power from QSO to QSO. Before I answer the CQ, I adjust my power to: 500 mW, 1 W, 2.5 watts or 5 watts. If the signal is very strong, I use the S-meter to determine the power that I wil use. To make such a low power I use an attenuator of 10 dB. So I am always too late for the first opportunity to answer. Using the lowest possible power is great fun, but can also be a nerve wracking enterprise. 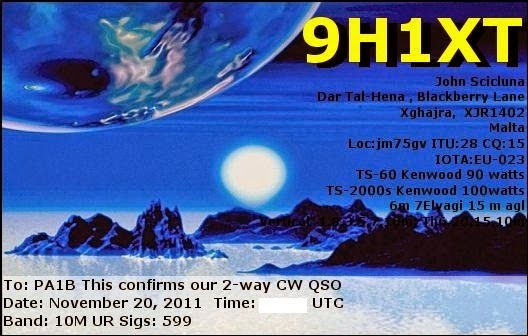 * In the QSO with SP8HW I realized that listening is very important. When I started to answer a CQ, I heard an other station answering, in the background. 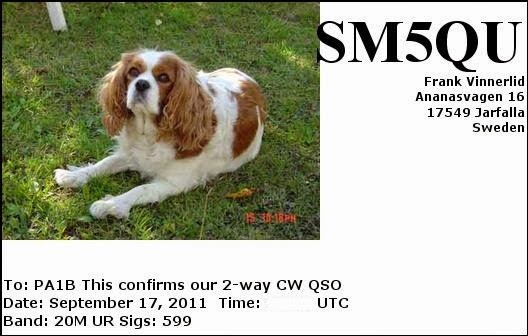 When he stopped, I gave my call twice, in the clear and made the QSO with 500 mW. * I worked 3Z50AYP in a hurry. I was so excited, that I used 500 mW instead of a lower power. * SP6EIY can not hear me with 500 mW and 1 W. Maybe later. * I seized the opportunity to switch back to 500 mW, while waiting for a very loud station. It's important to immediately adjust to 500 mW, after a QSO with 1 W or 5 W.
* I had to push to make a QSO with SP2GJV with just 50 mW, which is quite remarkable. There was a lot of QRM in the background. * Station after station, visited SP3FYX. I had to have a lot of patience, not to increase the power to 5 watts. And finaly, to use just 500 mW. * I love chirpping stations. I work SP7.... with 5W. * Worked SP9YFF with 500 mW, before I got the call complete. I realized that . . . FF was a new one. * After the QSO with SN8N, I realize that I should have used 50 mW instead of 500 mW. * One station after the other goes in to the log. It 's a mix of 500 mW and 5 W.
* It's very busy. I have to look for stations that are calling CQ with no takers. * SP6ZDA At the last moment, I decide to switch in the 10 dB attenuator. Resulting in a QSO in the clear, with just 50 mW. * Now I recognize new stations by the last letters of the call. * 3Z8Z fades. I need 5 W.
* The numbers of my computer program and the Morse Machine differ. I correct the Morse Machine. * SP9MZS Earsplitting signal. But the setting is wrong, so 500 mW instead of 50 mW. I could make all these fine QSO's, thanks to all the fine operators in the from Poland. Last week the number of eQSLs in my eQSL inbox had risen to more than 100. Between these QSLs were many 1000 Miles per Watt QSL's. For these QSL's, I determine the distance and calculate the Miles/Watt. 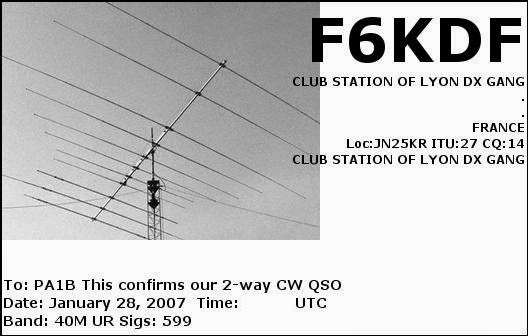 I mention these numbers in the comment field of the individual eQSL. 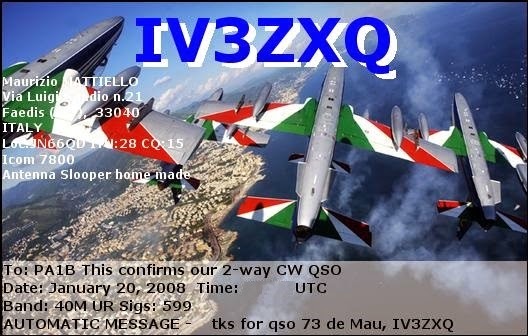 Last week I replied many eQSL's. to about 10 remaining eQSLs. But when opened my eQSL inbox a few days later, it knocked my socks off. 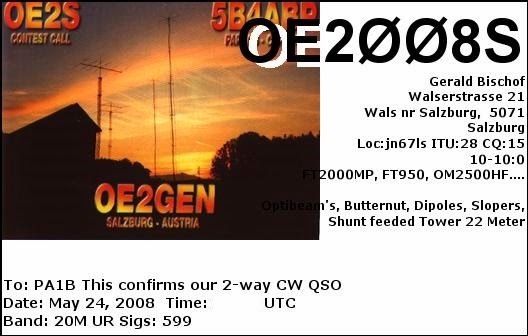 There were 208 eQSL's in my inbox. This number is very large to reply manually. A doubling in a couple of days. And what if that number doubles again? WSPR database for spots of Julian G4ILO. Julian transmitted with a power of 1 mW and 20 mW. Calculated electrical field strength, E, in microVolt per meter. For details see the WSPR Propagation Analysis page of this Blog. The lower the electrical field strength the better the propagation. A power ratio of 10 means 10 dB. Please notice the the value for E is given in Volt/m, so a Voltage ratio of 10 means 20 dB. Which is indicated at the top of the table. A Voltage ratio of 10 is a ratio of 100 in power. The table shows stations that received the signals, that were transmitted with 1 mW and 20 mW. Notice the difference in field strength in spots made with 1 mW or 20 mW. The difference in field strength between the spots of 1 mW and 20 mW is about two steps in this table. This is about 10 dB. is 10 log (20 / 1) = 13 dB. The differences in propagation are huge. show a value of 0,3 microV/m to 0,03 microVolt/m. The ratio in voltage is 10 and the ratio in power is 100, which is 20 dB. Wow. 500 miles from my QTH in JO22na. a part of W, is less than 500 miles. these QSO's will be, more than 1000 Miles per Watt QSO's. This year I did not expect much of my Inverted Vee. Last year the top broke and I fixed the antenna temporarily. The top is now just 2 meters above the roof. But the antenna worked better than I expected. Click here to read about the state of the antenna. The number in red, show the QSO's with more than 1000 Miles per Watt. I just started in the ARI DX contest. because this is a DX contest, so I can work any station, so many stations can be worked with low power. For the first QSO, I selected the very strong signal of OM5WW and worked him with just 50 mW. 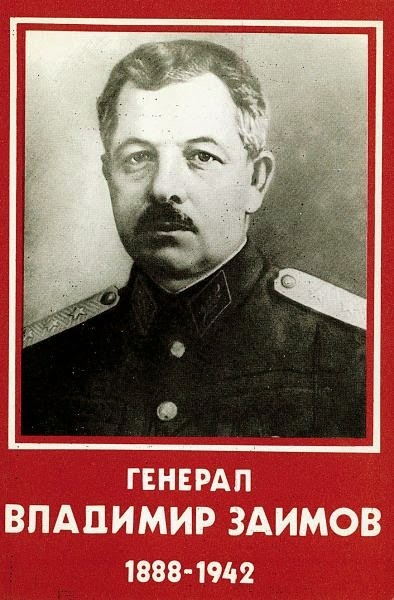 The second station was LZ69VZ. I like stations with special calls, so I gave him a call. After exchanging the numbers, something very remarkable happened. I got a question. At first I though that I had to repeat my call. And repeated my call. But the question was . . . . So the question was: what power do you use? 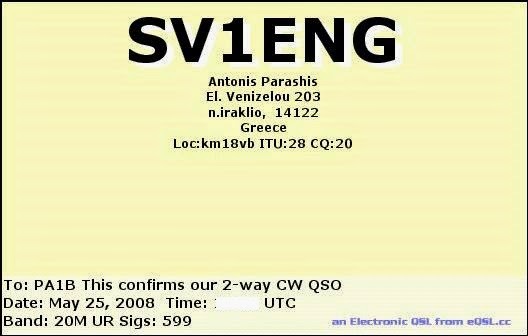 I immediately thought, this must an operator, that had met me many time before and knows from my QSL cards that I often use low power. And indeed, the operator is Gosho LZ1ZF, who I meet in many contests. Thank you Gosho. 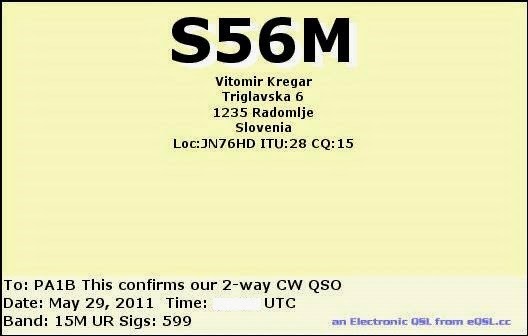 My 1000 Miles per Watt QSL for LZ69VZ will be on his way in a few weeks. If you hear Gosho, give him a call. Labels: 1000 Miles per Watt, ARI DX, Gosho LZ1ZF, LZ69VZ, PWR?